Product Description The B/R 9700 ProCycler Solvent Recycler (for alcohol and xylene) is a fully automatic system for recycling solvents in histology and industrial laboratories. Solvent recycling can recover money that is going down the drain or being hauled away. Solvent Recycling made easy! Let this fully automatic solvent recycler do all the work. Simply put the used solvent into place, push start and let the solvent recycler do the rest. When the recycled solvent is ready for reuse, the solvent recycler will alert you with an audible alarm and a message on the display. Solvent Recycling is safe! The microprocessor controller watches over the solvent recycler, constantly checking all safety parameters. At the end of the solvent recycling program, the equipment stops the process automatically and lets you know that the recycled solvent is ready for reuse. Recover Pure Solvents and reuse them! 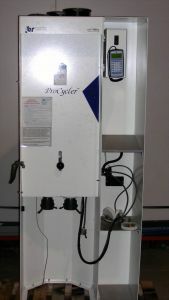 This solvent recycler uses microprocessor control to assure that the solvent recycling process yields the purest possible solvents. The microprocessor is preprogrammed with up to 19 different solvent recycling protocols. Solvent recycling protocols can be easily optimized or added for your specific needs. The microprocessor minimizes the amount of operator time required for each fractional distillation. Call up your stored program from one of 19 available memory locations and let the microprocessor perform the fractional distillation. Each program can store up to eight distillation fractions. Each fraction has programmable open and close temperature cut points, heat rates, reflux ratio and equilibration times. Programmable shut down at the end of the distillation run. The microprocessor allows easy editing of each of the parameters while the distillation is in progress. Includes 2 boilers - one for alcohol and one for xylene.